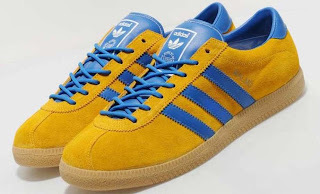 The first of the City Series collection released by adidas Orginals during the 1970's/80's, The Malmo was also one of the most popular of the range, lending itself well to the football terrace trend of the 1980's. The yellow/blue colourway repesents the colours of the Swedish national flag. From the adidas Originals Archive, this exclusive re-issue comes in a premium suede upper with leather three stripe branding, and the original Malmo sole unit. They also feature a leather tongue and heel piece, and rounded laces.